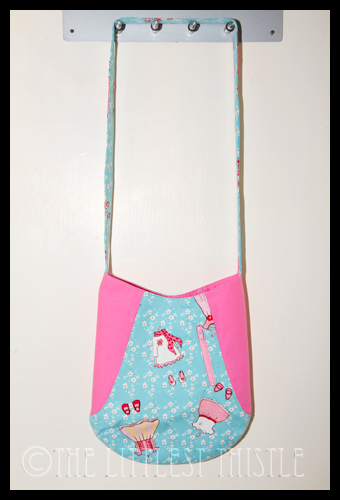 When I posted last week about doing the 241 tote review, I asked if anyone had any questions or any points that they particularly wanted me to look at, so following on from yesterday’s review over on Sew Sweetness, I’m going to go over both the questions asked, and the modified strap option I did. The main thing that had people scared was the zip option, so I’ll walk you through that first. 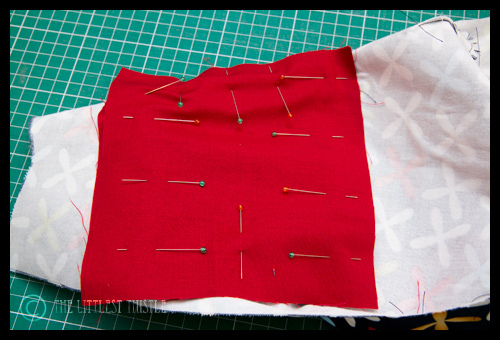 My first tip would be to add the outer pockets before you sew the 2 main pieces together at the bottom, as you’ve then got less fabric to try and wrestle with when sewing. Also, cut the pocket pieces 7″ x 6″ for them to fit best, keeping the 7″ edges parallel with the zip, as I found that leaving them at 7″ square put them rather close to the other edge of the bag. Then pin in place. 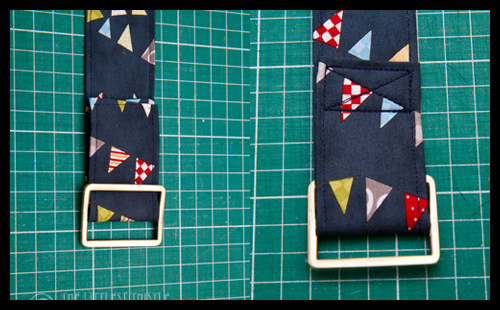 Note that I put my pins at right angles to my stitching line, which prevents fabric slippage during stitching. 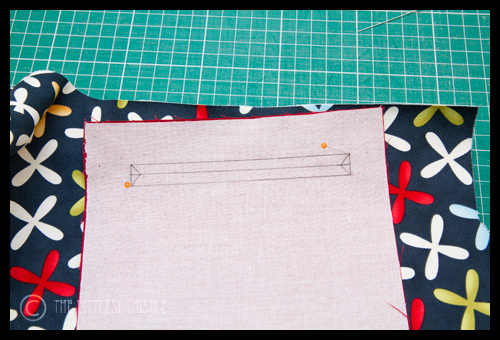 Sew all the way round the rectangle, backstitching at each end, then cut up that centre line between the diagonal lines, followed by cutting along the diagonals out to the corners. 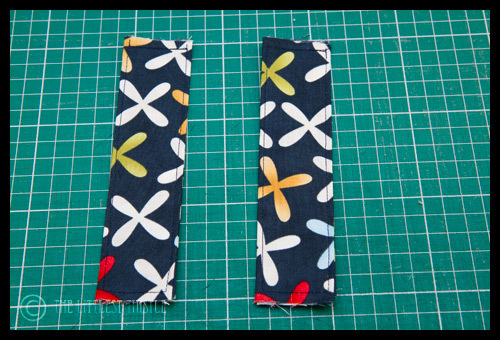 Make sure you use very sharp scissors to do this, but don’t cut your stitching! 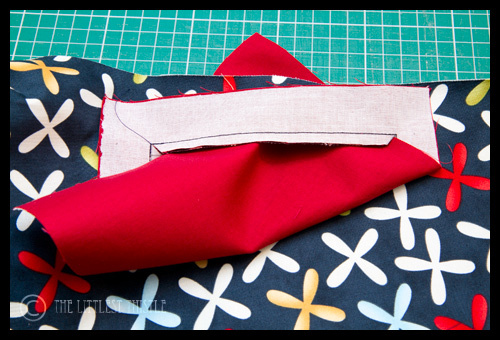 Take your zip and place it under the opening to check that it fits well, and at the open end sew a few stitches which will be hidden just under the body of the bag to hold it closed. 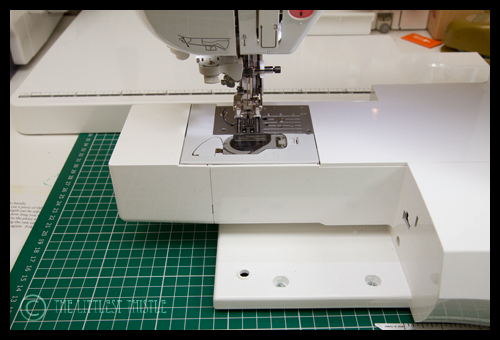 Don’t skip this, it will make it much eaier to sew the zip in! 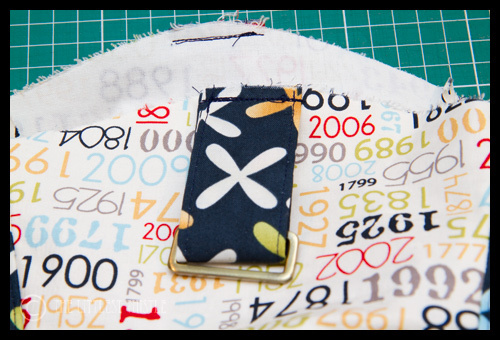 Now take your remaining non-interfaced pocket piece and place it face down onto the pocket piece with the zip. 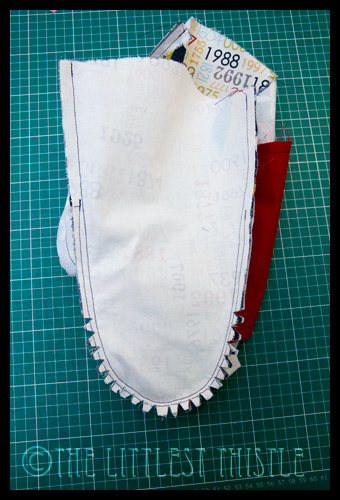 Pin all the way round and stitch in place, backstitching at either end for security. 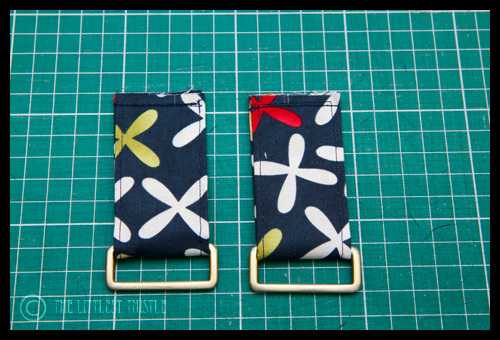 You will need an additional 2 6″ squares of strap fabric for the end pieces, plus a set of bag hardware consisting of 1 slide with a 1 1/2″ opening, and 2 rings – D rings, rectangular or any other shape you like as long as they are also with a 1 1/2″ opening. I get my hardware here and have had very good service from them, also for purse frames and magnetic snaps. 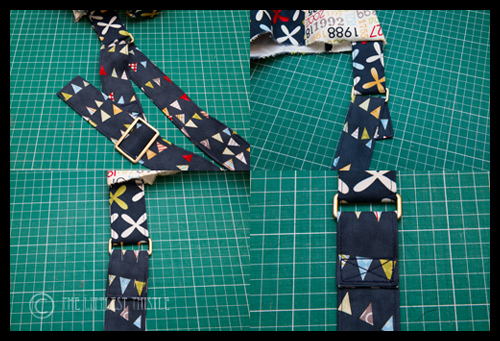 For the strap ends, fold in half and press, then fold the sides into the centre fold line and press again, in the same way as the instructions in the pattern for the main strap, then top stitch all the way round, starting at the open edge. Take one of the strap end pieces and one of the rings, then thread it on. Fold in half to match the two short ends, and baste in place, then repeat for the other strap end. 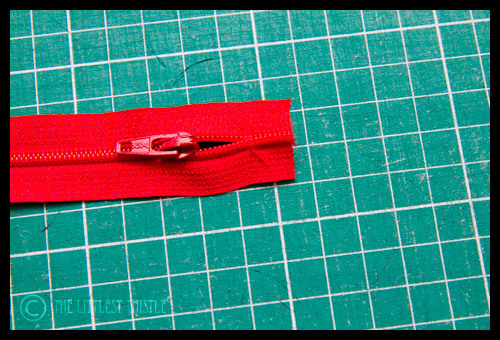 Pin to the bag as per the instruction to attach the main strap, and baste in place – to find the centre point of the side piece and the strap end piece, fold in half and finger press a small crease in at the top, then match these together. You may now continue with your pattern as before. I have the pattern, but not made it yet as I want to do the zipper version, but what I really erally want is to know if it is easy (I am a beginner – ish) to put a zipper along the top, for extra security. 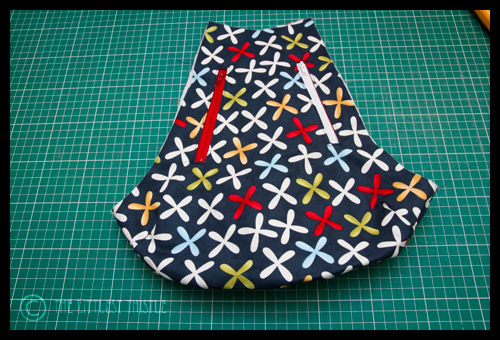 I have addressed the zip pockets above, but unfortunately I don’t think this is suitable for a zip at the top. The top of the bag is curved, which, combined with the lack of a traditional side seam and the bulk of the handle ends would render direct application pretty much impossible. Although there is a floating bridge type zip option possible, again, there isn’t anything to attach it to – normally these are applied on bags with a band at the top, which allows the ends of the bridge to be caught in the lining. With a complete redesign of the top of the pattern for the lining pieces it would theoretically be possible, but maybe a couple of extra snaps at either end might do just as well. 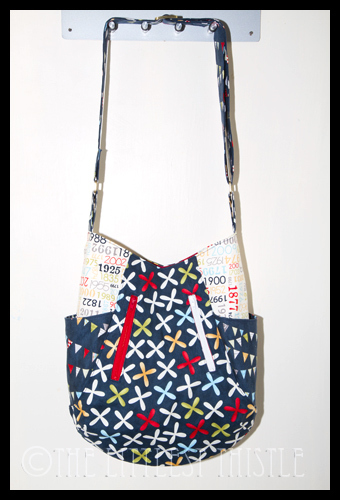 I won this pattern for Purse Palooza and made one yesterday! I wimped out on the zipper version – next time!! EASING IN CURVED SIDE WITH POCKET – I wanted it pucker-free and happily exterior came out pretty well. Lining was diff story …luckily it’s inside – was getting antsy to finish I guess! 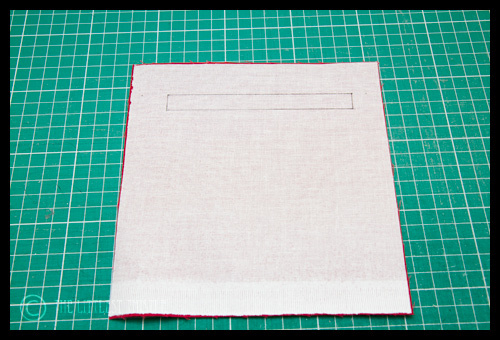 Okay first off the top stitching – this serves several purposes, one for a professional finish, and the second to hold the bulk of the seam out of the way of the lining in the case of the sides, and at the top it will actually hold the lining in place. Without it, the lining will wander off, and you will end up with a rather misshapen bag fairly soon (I have been that beginner bag maker, I know these things ;o) ). Upcycled jeans are, unfortunately, rather too heavy for this bag, especially if you interfaced them, maybe try again with quilting weight cotton. 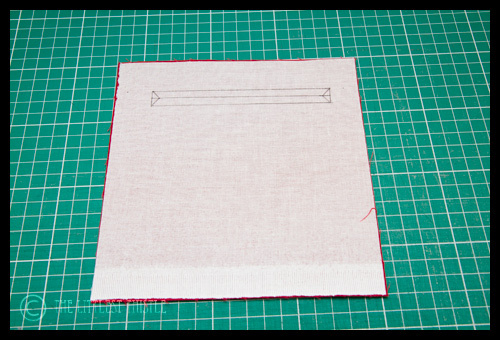 Also, when top stitching, I usually go about 1/8″ from the edge or seam of whatever I’m stitching. In the review I suggested you use pattern weights and a rotary cutter for cutting out, as this will be truest to the paper pattern shapes – with pins, especially on heavier fabric, you can end up with pieces quite a bit bigger than the paper pattern, and sometimes a rather different outline as the pattern and fabric are both twisted out of shape with the pins (painful experience here). 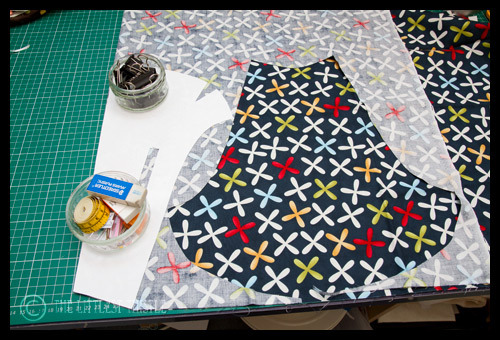 Alternatively, you can draw round the pattern pieces and cut out with dress making scissors. 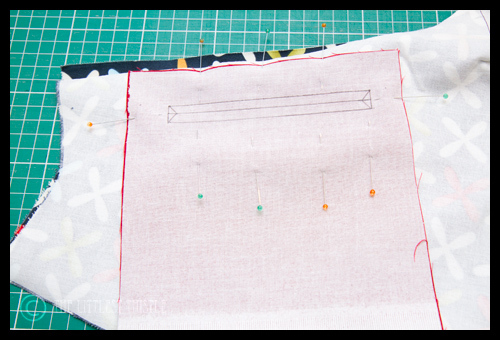 The seam allowance is 3/8″, which is not particularly common, so you may need to measure exactly where that is on your machine – I usually use a combination of the edge of the foot I’m using (which 95% of the time is my walking foot) and the needle position rather than relying on the lines on the bed of the sewing machine, as when sewing curves, those lines are particularly difficult to see (which took me years to work out!). 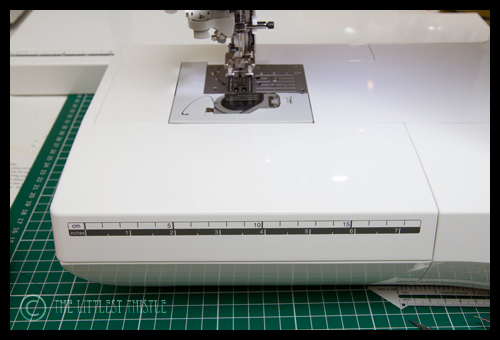 You will need to clip your curves, cutting little notches all the way round the curves right up to the stitching line (but not through it!) 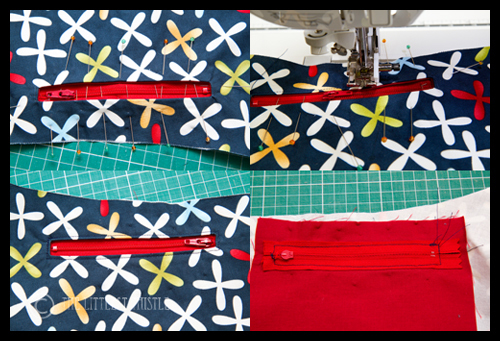 This will allow your fabric to relax when turned right side out, and shouldn’t show puckers. I hope that’s helped everyone! Thanks for all your great instructions and I am going to do as you suggest and maybe put two buttons or magnetic studs along the top. I get paranoid about people dipping their hands into my handbags! I've never tried one with a zip because I've never felt the need…but then again maybe I will one of these days! What a fabulous pattern reviewer you are.Very detailed and helpful. Thanks so much! 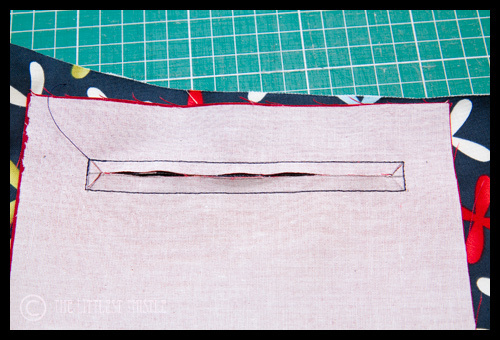 My free arm was still too big for the 50%, so I finally figured, just as I got to the last inch, if you sew with the inside upwards you can stitch quite easily without getting all caught up – this would work for Laurie and her cabinet. Top-stitching the sides, not so easy! I see, you're telling me to zip it! You are the queen of inset zippers, which I, for one, am thankful for 🙂 One of your tuts got me past my anxiety and I LOVE them now. Your bag is great! The strap alteration is genius. Thank you for such a clear tutorial! I think I could try it now! I took my sewing machine OUT of the cabinet last night and used the free-arm as intended. OMG. I'm convinced! 🙂 Usually stitch from inside-out I guess, so learning curve: a pin holding the lining from bunching caught up underneath. Thank you, thank you, thank you for the pocket tutorial! I was at a complete loss on how to do the pockets/zippers with just the tote directions. You saved my sanity! So awesome! So well explained and the pics are great!! Ps, Now I am going to put the zips in my next 241 totes, instead of skipping them like I did with my first one!!! hi!! love tis bag !!! can you share the-pattern with me? ?Thank-you very much!! i'm from arentina,huggs!